Back in 2009, when President Obama chose Kathleen Merrigan as second in command at the US Department of Agriculture, celebration erupted in sustainable-food circles. 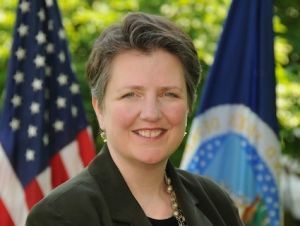 Last Thursday afternoon, the USDA announced the imminent end of Merrigan’s run as deputy secretary of ag with a terse note from USDA chief Tom Vilsack. It gave no reason for her departure, which is effective at the end of April. For generations, the message from the US Department of Agriculture to the nation’s farmers could be summed up in the famous piece of advice offered by Ezra Taft Benson, President Dwight Eisenhower’s USDA chief: “get big or get out.” That’s why Merrigan’s tenure is so significant. Under her influence, the USDA suddenly began to urge consumers to “Know Your Farmer, Know Your Food,” and made a concerted effort to marshal USDA resources to support local and regional food systems supplied by farms of varying scales: the opposite of the globalized, monolithic system envisioned by Benson and put into place with the consent of his successors. Red the rest of the article here.